Dharma Drum Mountain is a Melbourne community learning and living the Buddha's Teachings through the tradition of Chan Buddhism, as established by the late Chan Master Venerable Sheng Yen. Situated in Mitcham, a mere 30 minutes' drive from Melbourne CBD, DDM Melbourne welcomes everyone regardless of faith and ethnic backgrounds. Activities include meditation sessions, dharma talks and workshops on Buddhist philosophy and retreats. 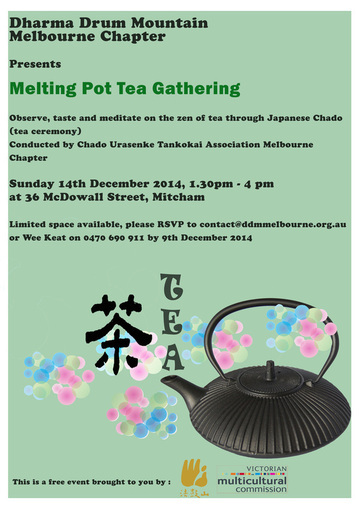 DDM Melbourne promotes interfaith, multicultural and community harmony. The group actively supports and engages in Buddhist, Interfaith and Community events and initiatives.